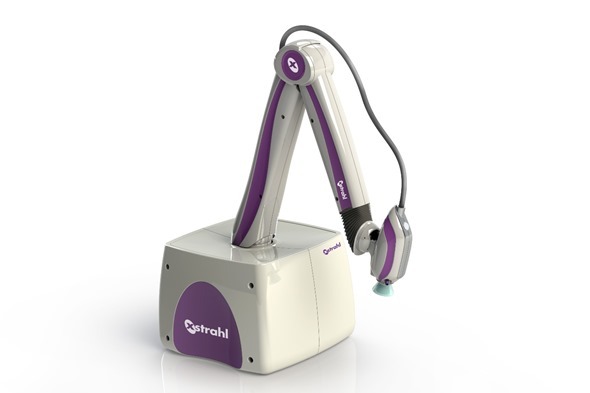 With a presence in over 500 clinics around the world, Xstrahl have drawn upon their vast clinical expertise to develop a revolutionary system that has been specifically designed for the treatment superficial skin cancers and skin conditions. Photoelectric Therapy is a proven clinical technique where low energy photons are prescribed to treat a wide range of dermatological conditions. The technique offers patients a non-invasive treatment with excellent cosmetic results. In an era of personalised medicine we should expect skin cancer treatment to be minimally invasive on the way we look. At Xstrahl we have developed a solution that will enable more patients to gain access to a simple but effective and curative way to treat Non Melanoma Skin Cancer. The Xstrahl Photoelectric Therapy System has a depth dose profile perfect for the treatment of superficial skin lesions. The high dose output enables treatment times to be kept to a minimum in the same manner as electronic brachytherapy systems. The small foot print and weight of the unit enables it to be used within any clinical facility, making it more accessible to all patient groups. Xstrahl will unveil the exciting new therapy system at the start of the Annual Meeting of the American Society for Radiation Oncology (ASTRO) conference in San Francisco September 14-17, 2014. This device has not yet gained market clearance in the USA.